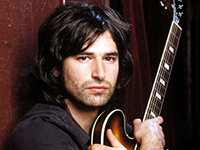 Pete Yorn is proof that fairy tales do come true. The 26-year-old drummer turned singer/songwriter landed a record deal after an impromptu performance of his song “Life on a Chain” for a Columbia Records A&R person. In 2000, a few years after graduating from Syracuse University, the New Jersey native moved to Los Angeles, CA, where he began writing music for film and television. Things heated up when Yorn scored the 2000 Farrelly Brothers film Me, Myself, & Irene, starring Jim Carrey. Among Yorn’s accomplishments, his song “Strange Condition” also appeared on the Elektra soundtrack to the film, and Yorn’s “Just Another” is featured on the compilation album for the WB television series Dawson’s Creek, Songs from Dawson’s Creek , Vol. 2. Yorn co-produced his 2001 solo debut album, Musicforthemorningafter (Columbia), with Brad Wood (Placebo, the Smashing Pumpkins, Liz Phair, Sunny Day Real Estate) and R. Walt Vincent, while playing the bulk of the instruments himself. Yorn went on to tour the world for 18 months, allowing Musicforthemorningafter to go gold by April of 2002.